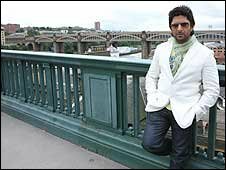 Bollywood filmmaker Arshad Warsi has praised Newcastle Council for their co-operation in letting him use the city as a backdrop to his upcoming movie Hum Tum Aur Ghost (Me, You and the Ghost). Warsi is the writer, producer and star of the film and chose the city to shoot part of the film after an extensive research of locations across the United Kingdom. "Newcastle council were more than happy for us to be there," he told BBC Asian Network. "I got all the support I needed and more from them. "The people of the city adapted to us too and got used to seeing us around various locations in the city." The cast and crew of the romantic comedy spent almost three months in the city during summer 2008, with Leazes Park, The Angel of the North and Grey's Monument being used to film parts of the movie. Warsi added: "The architecture of the place was absolutely stunning - the streets, the buildings, everything's fabulously maintained. It's beautiful. "Many people who've seen the trailer of the film ask me if I'd done the filming in Budapest!" But when questioned on the Geordie accent, Warsi laughed: "I never understood a word of it." The UK has been a popular destination for many Indian films over the years, although most filmmakers choose London as a venue. Karan Johar's 2001 blockbuster Khabi Khushi Khabie Gham (Sometimes Happy, Sometimes Sad) featured various London locations, including Covent Garden, Piccadilly Circus and even the Bluewater Shopping Centre. More recently Namastey London (Hello London), starring Akshay Kumar and Katrina Kaif, showed The London Eye, Houses of Parliament, and St Paul's Cathedral. Others like Vikram Bhatt chose the tranquillity of Allerton Castle in North Yorkshire for his supernatural thriller 1920, while Mujhse Dosti Karoge (Will You Be My Friend) had the Lake District as its backdrop. Former Miss India Dia Mirza described Newcastle as a "party capital"
But Newcastle's allure is growing in popularity as Andrew Dixon, chief executive of NewcastleGateshead Initiative revealed. "NewcastleGateshead is a world class location and we were delighted to welcome Arshad Warsi and crew to film in the city," he said. "Since that visit two more Bollywood movies have been filmed here which ensures people across the world will see the iconic monuments of our twin cities." Hum Tum Aur Ghost is released on 26 March and is a supernatural story about the ability of photographer Armaan, played by Warsi, to see lost souls and help these 'ghosts' to cross over. Armaan's girlfriend (Gehna), who becomes irritated by his behaviour, is played by former Miss India, Dia Mirza, who also enjoyed filming in Newcastle. "There's a certain buzz about the place that the film has captured perfectly," she said. "The characters look like they've lived there all their lives. I had a blast shooting there as the place is like a party capital."